Some time ago I had a phone call from a woman who asked if she could call in to the Lounge to talk about a local magician. The woman was author Ann Beedham and the magician she wanted to discuss was Randolph Douglas, known as Randini. I have to confess that I’d never heard of the guy. Ann brought with her copies of magazine articles she’d written about Douglas — his short career as an escapologist; his friendship with Houdini; his museum, The House of Wonders, in the Derbyshire village of Castleton a few miles from Sheffield. He was clearly a fascinating character and I promised to see what I could discover about him. I spoke to local magicians and those interested in the history of magic and escapology. Most had only heard of him vaguely, if at all. At this point I was beginning to think that Ann had set herself an almost impossible task in producing an entire book on this elusive man. I’m very pleased to say I was wrong. I rang the publisher and managed to get hold of stocks in time to take them to Southport. It became one of our best-sellers. Thanks must go to Peter Lane, who bought a copy on the first day and passed the word around, and to Eddie Dawes, who kindly gave us a mention during his History of Mystery talks. “The stunt that helped to make Houdini a legend — escaping from a straitjacket whilst suspended hundreds of feet in the air wasn’t invented by the Master Mystifier. That honour belonged to a long forgotten Sheffield schoolboy… Randini: The Man Who Helped Houdini is the remarkable story of a fan who helped reinvent his hero. Modelling himself on the escape artist, collecting every picture and news item, the young Randolph Douglas lived in world almost as magical as the music halls glowing like coral reefs in the grey industrial wasteland. His pocket money bought not toys but locks, handcuffs and even straightjackets as he dreamed of future glory. “What Douglas did next would change the course of magic’s history.” William Kalush and Larry Sloman, The Secret Life of Houdini. This A5, 240-page book includes copies of letters between Houdini and Douglas; unpublished images from The Magic Circle archives; a detailed look at The House of Wonders, with its eclectic collection of locks and curiosities, details of acts seen at the Sheffield Empire; plus extensive background notes. We now have further stocks available for immediate despatch from our own little glowing reef here in Sheffield. 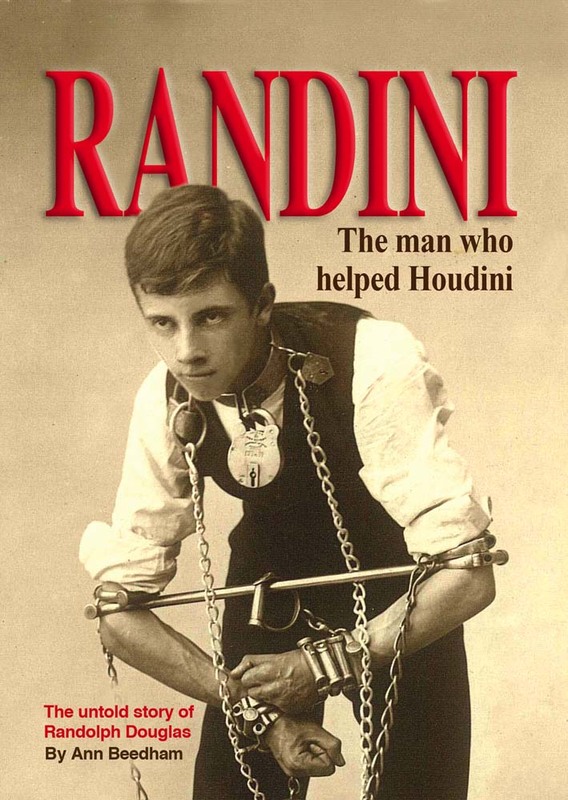 Randini: The Man Who Helped Houdini is available at the bargain price of £9.99, plus postage £2.65 (UK First Class), £4.20 (EU Air) or £7.77 (Rest of World Air). Paypal accepted.